We rv full time and a few months ago we swapped out our old motorhome for a 1993 Ford F-250 pickup truck and a 5th wheel camper. My husband and I are very tall and we quickly noticed that WE had a hard time getting in this big 3/4 ton machine. Then we looked at our 80 pound, 11 year old dog sitting on the ground by the truck door, giving us that look that said "um, no way guys...I'll never make it in there...have a nice trip, nice knowing ya!" Obviously, my creative and frugal brain had to get to work...and FAST. No way we could lift her into the cab of the pickup. We live a very frugal, cash only lifestyle as fulltime rvers - but money wasn't the only issue that led us to build our own cheap dog truck ramp. We had quite a few obstacles to overcome as Hannah, our dog, scoffed at our new, used monster that towered over her large body, making her look like a Chihuahua next to a VW Bug. But Hannah knew I wouldn't let her down and would accomplish my goals. After all, she loves the diy cheap, no sewing large dog bed inventions I came up with - a smaller bed for in the rv and outdoors, plus a longer Scooby Doo bed for the backseat of the pickup truck (see photo! )...no reason to think I wouldn't create a way to get her into that truck. We did have a pickup truck years ago when we were pulling a travel trailer. That truck had a topper so she rode in the enclosed bed of the pickup (would have still needed a dog ramp with this tall pickup). But a 5th wheel hitch sits in the truck bed now so a top is out of the question. Hannah would be riding in the backseat of our extended cab now and the doors don't open wide enough for us to even consider lifting her because there is no place to stand. UGLINESS: I know it sounds funny, but because Hannah would be taking up the back seat, where does the ramp go? In the truck bed, of course...which isn't enclosed or covered! No way I'd put a fancy, store bought pet ramp in the bed for anyone to grab in a heartbeat. I wanted it to look worthless and kinda ugly, to be honest! Mission accomplished! HEAVY: It had to be heavy enough to hold our dog's weight without flexing and also so it wouldn't blow out of the truck when driving down the highway. COULD BE EXPOSED TO THE ELEMENTS: Seeing as we planned to leave it in the truck most of the time, in the open air, we had to make sure it didn't fall apart from rain, wind, etc. WOULD NOT FREAK HANNAH OUT: Hannah is a little neurotic anyway, and if my invention didn't have proper traction, width or strength, she'd never go up it. CHEAP: We are on a very limited budget so wanted to do this for next to nothing...and I did. How To Make A Dog Ramp: My Pet Ramp For Truck Project Took Minutes! So how to make/ a dog ramp super fast and cheap? Here's how I did it in merely minutes...and the good news is Hannah didn't even hesitate getting into the truck on the first try! You will only need a few supplies and a few minutes to put it together...promise! Carpet remnant(s) to cover one side: the ones in the photo of our ramp were from Dollar Tree with sturdy rubber backing, but thrift stores often have cheap carpet remnants you can cut to fit. I chose pieces because I could get them more taut. I worried one gigantic piece might start bulging up over time. Stanley staples 9/16": This size is important! Don't use shorter ones which can come out and hurt your dog's paw (plus they won't go through the carpet and wood anyway). Cabinet handles (optional): For ease in carrying, you might want to screw in handles on the side, but we haven't done that as of yet. While I was making this, I joked that if my dog ramp fails, it would make the ultimate scratching post for our huge rving cat, Spot. If you haven't figured it out already, simply lay the carpet down and staple like crazy. I used pieces and stapled all around all four sides of each one. They lie so flat and are strongly embedded so no worries of hurting Hannah's paws. Dog Ramp For RV? Bonus! These Make GREAT Dog Ramps For RVs!!! Had No Idea I Would Need An RV Dog Ramp For My 5th Wheel Camper! I've never needed an rv dog ramp in all of our travels, but not long after I made my own cheap dog ramp for my pickup, Hannah got injured (that's her in the photo). The poor thing got her toenail caught in a floor vent in the camper one evening, requiring complete removal and sedation at the vet's office. Needless to say, she came home limping, drowsy and barely able to walk. Once again we were faced with not being able to lift her into the rv. Then it hit me...GRAB MY HOMEMADE DOG RAMP! It was a perfect fit and covered our three stairs ideally. Sure, due to injury, it wasn't a smooth run up the pet ramp, but we could now gently guide her up instead of risking her hurting her foot further. So the bonus is that this truck ramp we now haul around in the bed of our pickup can come in handy if Hannah is every unable to make it up the stairs in the future. All in all, our make your own dog ramp was a complete success and had all of the features we required and more. That said, there are a few considerations to keep in mind...so maybe you will want to enhance my original idea. Obviously, plywood is heavy and getting it in and out of the truck is not a problem for us, but could be for others. I would definitely recommend putting handles on it and putting your tailgate down to remove it, for ease and minimal strain. Also, truck sizes and heights differ, so measure a safe angle and width for your pickup. The board should lay on the floorboard of the passenger seat (Hannah hops onto the front seat, then jumps into the backseat), NOT at a steep angle all the way to the top of the seat! She's a big dog so the step up to the front seat is nothing for her. If your dog is lighter than Hannah's 80 pounds or smaller, you can get a thinner or narrower sheet of plywood. But test it in the store by putting your foot on it and pushing with all of your might. If it bows and flexes it will scare your dog, so be sure it stays stiff and is strong. Splinters! Our plywood is really smooth, but splinters are a risk. You can either install handles or put carpet on the back side, too, to minimize the risk. Those are the only extra make your own dog ramp tips I have to offer. If you have other ideas, be sure to share them in the comments below! These demotivational cat posters capture the true essence of cats - sarcasm. A funny kitty poster will surely brings smiles to home or office. The trick is deciding which one! 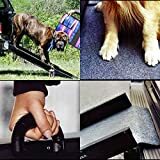 Dog Ramps For Pickup Trucks Or SUVS - Hitch Steps! 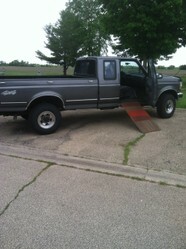 More Dog Ramps For Truck If DIY Isn't Your Thing! frugalrvers, Has Spot ever used Hannah's ramp as a scratch post? Well, you have solve my problem. 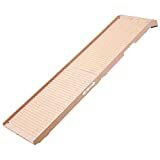 I was in search for a Ramp but i as usual good quality ramps are very expensive and i can't buy a low quality product. You guys have done a great job. Thank you! Thank you, Anna! Hope it works well for Ella - truck cabs are so difficult for a dog to get into...as you know! Thanks for the post! just purchased our first truck and really appreciate the frugal lifestyle, especially now with payments! My dog Ella is overweight and short-legged so she is not agile enough to jump in the cab. I'm going to give this a shot! p.s. cheers to you for taking the leap and ditching the material lifestyle! How does it not slip off the floor of the truck? Also I would like to see pictures of the Scooby doo bed.... My dog loves "Scooby Snacks". That would be so cute for him. He is 80 lbs and has just has both knees replaced. I do believe he is still going to need a ramp. Thank you! Hello, thanks for the post. Currently we are RVing with a one-ton 4x4 and fifth wheel. and our 45 lb 11 year old dog has hurt herself during a wonderful outing chasing jack rabbits!! (possibly torn knee ligament?). No option to purchase a ready-made ramp since we are currently in Mexico. Today my husband said he was going to go get a chunk of plywood to create a ramp. Then, I found your post and knew we were on the right track!! Only question ..... what thickness plywood did you use? You never mentioned that in your post. Thanks for your comment! Looks like you have a lovely store full of pet products...will have to check it out! Ramps come in very handy when traveling with an older dog or even with any dog for that matter. It greatly eases the strain on their joints, but not having to jump up and prolongs their health.